I’m a voracious reader, I love to read stories about successful people and their habits, and doing so has led me to conclude this: the thing that separates the Donald Trumps and Bill Gateses of the world from those of more modest means – me, for instance – is our morning routines. They hold 6:00AM staff meetings, an hour when – if I had a staff – they would surely turn and run for their lives if they caught a glimpse of Mr. Bedhead hovering over his coffee pot in my kitchen. Now, about those Ratatouille Poached Eggs: this being the height of eggplant-tomato-zucchini season, I just had to share this recipe with you. I adore this savory dish, even if I’m still uncertain whether it makes a better brunch or supper. Thing is, long about now my fridge – maybe yours too – starts looking like the remnant section of the ratatouille store. This recipe is one I can always count on to use up bits and pieces of the vegetables in question. The kicker, and the secret that makes this version stand out from your run-of-the-mill ratatouilles, is the way that we make spoon-size depressions in the ratatouille…dollop them with pesto…then slide in the eggs. Cover, cook just long enough to set the whites, and you’ve got poached eggs fit for a millionaire. 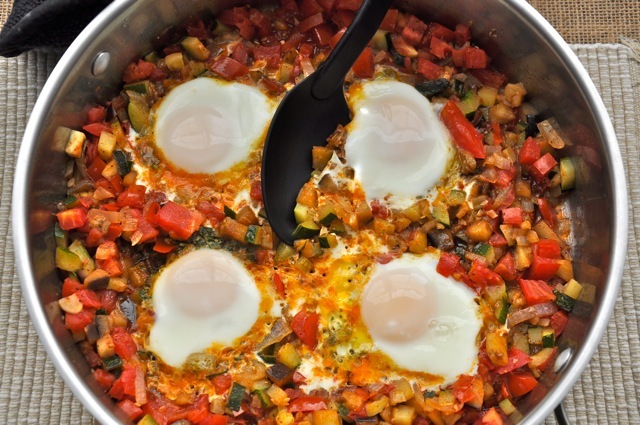 Where on earth did I find such a terrific recipe for Ratatouille Poached Eggs? 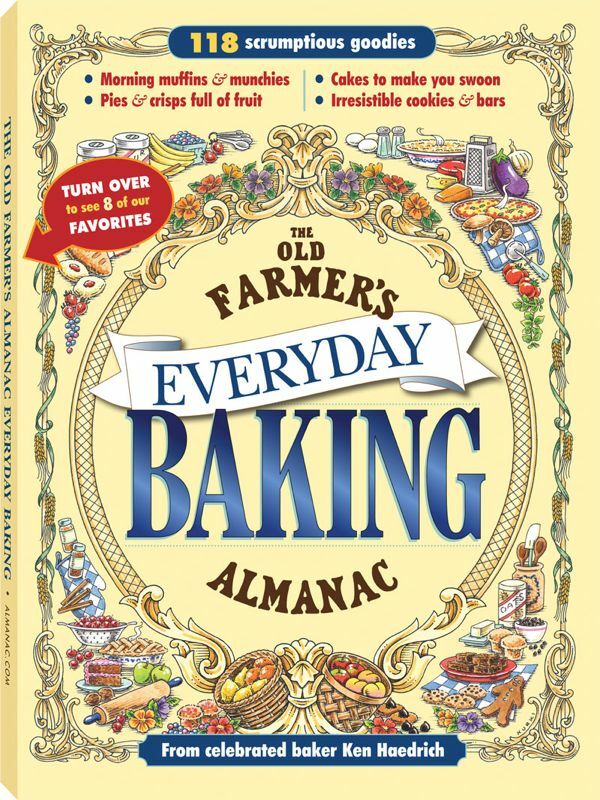 Well since you asked, it’s from page 186 of my beautifully photographed, hot-selling book, Comfort Food, published by The Old Farmer’s Almanac. 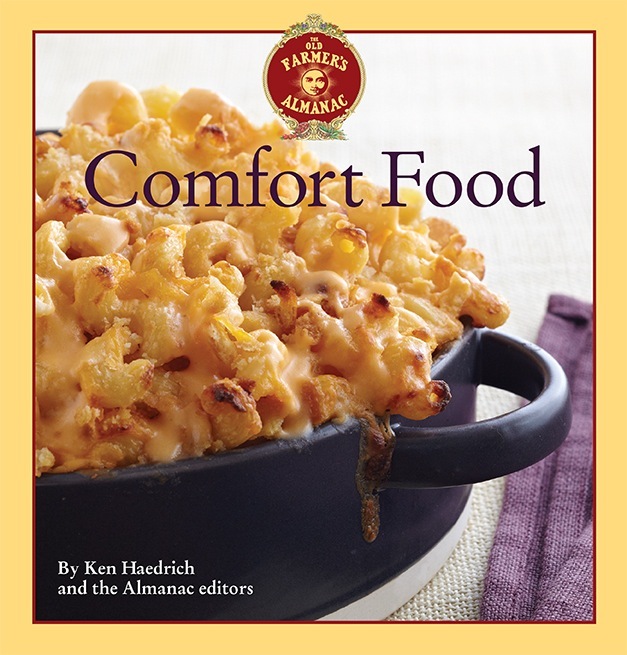 I know: when you think of comfort food you usually think of hearty, stick-to-yer-ribs cold weather fare like meatloaf, mac-and-cheese, and all the rest. And yes, my best versions of those are all here, too – recipes you’ll be craving a few short months from now. But there’s a surprising number of light, summery recipes in Comfort Food as well, like Quinoa Tabbouleh…Tomato, Watermelon, and Feta Salad…Shrimp Tacos…and Bourbon and Brown Sugar-Glazed Salmon, too, which is really super when you do it up on the grill. That’s all for now. Thanks for tuning in, and do stay tuned because coming soon to The Pie Academy blog are two pieces you won’t want to miss: we’ll bake a summer fruit slab pie – in a jelly roll pan – that’ll reshape the way you think about pie. And I’ll show you some neat tricks that’ll help you roll the perfect crust, even in this summer heat. Heat the oil in a large, nonreactive* skillet over medium heat. Add the onion and cook for 3 to 4 minutes, until soft. Add the zucchini and eggplant and cook for 3 to 4 minutes more, partially covered. Add the garlic and paprika and cook 1 minute. Stir in the tomatoes, cover, and bring to a gentle simmer. Add the salt, pepper, and a small spoonful or two of balsamic vinegar, to taste. Cover and cook gently for 7 to 8 minutes. With the back of a large spoon, make four depressions in the ratatouille. Drop 2 teaspoons of pesto into each. One at a time, crack each egg into a small bowl, then slide the egg into a depression. Cover the skillet and gently cook the eggs, for 4 to 6 minutes, or until the eggs are done to your liking. Garnish with the parsley and olives before serving. Makes 4 servings. *Note: a nonreactive pan is one that won't react with acidic ingredients such as - in this case - tomatoes. Reactive pans include aluminum, cast iron, and copper. Stainless steel, enameled, and nonstick coated pan are all considered "nonreactive."